With Father's Day just a week away, I thought you might need some gift ideas for dear old Dad or for your dear husband. 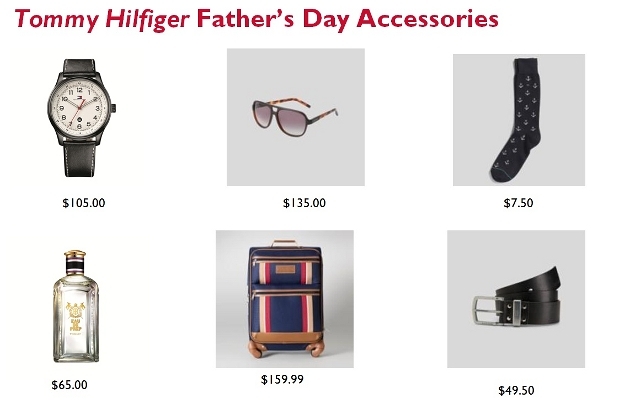 Here are some classic gifts from Tommy Hilfiger that range in price from $7.50 to $159.99. My own husband can never seem to have enough dress socks for work and he has a belt to go with almost every pair of pants. He hangs them together in the closet to help save himself time in the morning. I don't know if that is just genius or if it actually falls into the quirky husband category. What do you think? All the gift ideas below can be found at Tommy.com . . .